Warning: Stop Using Garlic If You Are in These 6 Types of People..
Garlic is an herb best known as a flavoring for food. Over the years, people have used garlic as a medicine to prevent or treat a wide range of diseases and conditions. Nevertheless, there are six types of people who should not eat garlic. 01. People who have liver problems.. Some people believe that garlic is an antibacterial and antiviral food and it can kill bacteria and viruses, so they are eating garlic in order to prevent hepatitis. Also, people who already have hepatitis eat garlic every day to cure it. Garlic cannot be used to treat or kill hepatitis virus. Some elements in garlic may cause stimulation on the stomach and intestines, which may inhibit the secretion of digestive juice in intestinal tract, and affect the digestion of food, thereby aggravating many symptoms for the hepatitis patients, such as nausea. Moreover, the exaggerated use of garlic can cause anemia because some its components decrease red blood cells and hemoglobin. 02. People suffering from non-bacterial diarrhea.. If patients with diarrhea consume raw garlic, the spicy flavor of the garlic may stimulate the intestines which may cause intestinal mucosal hyperemia and edema aggravation, and make the condition even worse. If the diarrhea has occurred, consumption of garlic should be careful. 03. People with eye diseases.. Patients with eye disease should try to not eat garlic, especially those with poor health. 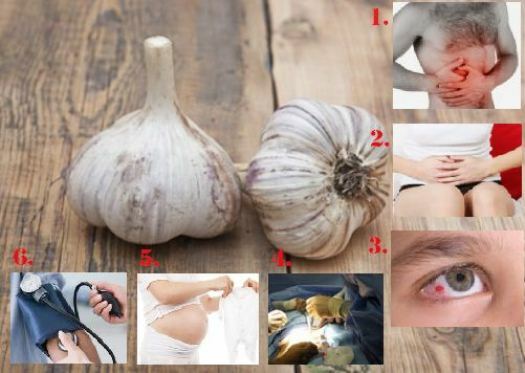 Doctors of traditional Chinese medicines believe that the regular consumption of garlic in large quantities for longer period of time would damage the eyes and the liver, but also it may trigger hypopsia, tinnitus, front heaviness, memory loss and so on. Patients who will undergo a surgery should stop taking garlic at least two weeks before a scheduled surgery because it might prolong bleeding. 05. Pregnant women and Women breastfeeding.. When taken in the amounts normally found in food, garlic is likely safe to use during pregnancy. There is not enough reliable information about the safety of using garlic on the skin if you are pregnant or breast-feeding. Hence garlic is possibly unsafe when used in medicinal amounts during pregnancy and when breast-feeding. 06. People with low blood pressure.. It can lower blood pressure. In theory, taking garlic might make blood pressure become too low in people with low blood pressure.